The property has been completely renovated by the present owner. It is built of stone under a synthetic slate roof. A new all water septic tank was installed in 2010. 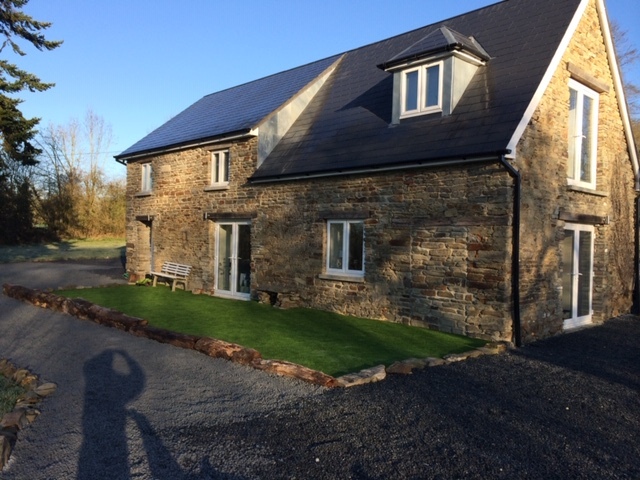 The property has been dry-lined and insulated, re-roofed, re-wired, the floors have been tiled and a bathrooms have been installed on the first floor. Upvc double glazed windows have been fitted and a new open plan kitchen. The accommodation is light and airy and the land is level and surrounds the property. Viewing is highly recommended. It is in a convenient position near Vassy in the Calvados department (Normandy region) in the north of France 43 km from Caen, the department capital. Vassy is 221 km from Paris (mainline train station at Vire (15 minutes away) and 295 km from the port at Calais. Rennes – Saint-Jacques Airport (RNS) is approximately two hours and 10 minute’s drive from Vassy. Flights arrive here from Southampton year round as well as seasonally from Cork, Dublin, Edinburgh, Exeter and Manchester. Many activities are available for those staying in Vassy with lots of glorious countryside to be explored making this ideal for hiking, horse riding and cycling. There are public tennis courts nearby in the area as well as several golf courses including one a Clécy, which is 20 kilometers from Vassy and the 18 hole Golf de Vire. Entrance Hall Glazed door to front elevation. Convector heater. Laminate flooring. Telephone socket. Cloakroom Laminate flooring. Extractor fan. WC. Vanity unit. Heated towel rail. Utility Room 1.87 x 1.86m Glazed door to rear elevation. Laminate flooring. Space and plumbing for washing machine. Built-in cupboards with solid wood worktops. Electrics. Extractor fan. Open Plan Lounge/Dining Room/Kitchen 10.25 x 4.94m Range of matching base units. Central island unit with breakfast bar. Solid wood worktops. Built-in electric oven and fridge. 4 ring gas hob with extractor over. Stainless steel sink unit with mixer tap. Wine fridge. Stairs to first floor. Window and glaze4d double doors to front, glazed double doors to east and glazed double doors and window to rear elevations. 2 radiators. Laminate flooring. Extractor. Landing Window to rear elevation. Bedroom 1 3.17 x 2.66m Window to rear elevation. Radiator. Laminate flooring. Bedroom 2 4.43 x 2.65m Window to front elevation. Radiator. Laminate flooring. Bathroom 2.89 x 2.13m Window to rear elevation. Laminate flooring. Heated towel rail. Bath with tiled surround. Twin vanity unit with mirror and light over. En-Suite Shower Room 1.79 x 1.61m Laminate flooring. WC. Extractor. Vanity unit. Large shower. Heated towel rail. Gravel turning and parking area. Gravel seating areas. The garden is laid to lawn. Mature trees. Garden shed. Fire pit. Paddock (not fenced). Mains water and electricity are connected. Broadband internet connection believed to be available. All water septic tank installed in 2010. Electric heating. Please note : There is no Energy Rating for this property because the owner does not have the last 3 years' energy bills for full time occupation.